Scotch Dumpling is a useful early-ripening culinary apple variety. The large apples cook down to a frothy puree, with a good flavour. The pink blossom is also an attraction. 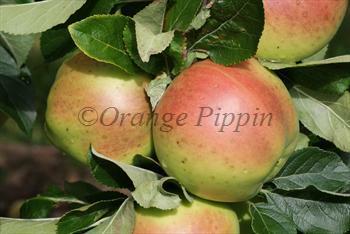 Please fill in the details below and we will let you know when Scotch Dumpling apple trees are back in stock. Scotch Dumpling is in flowering group 2. Scotch Dumpling is self-sterile and needs to be pollinated by another tree of a different variety nearby. Unknown origins, possibly Clydesdale in Scotland.